For anyone who loves to watch ice skating, get excited for a special show with some of the best professional and awarded ice skaters in the country. In celebration of its 75th season, Sun Valley Resort will present a special ice skating show with several of its past summer ice skating stars who will return on Tuesday, Dec. 21, for the Silver & Gold Ice Show at 6 p.m. at the Sun Valley outdoor ice rink. The show will feature performances by Evan Lysacek, Sasha Cohen, Brian Boitano, Ryan Bradley and Nathan Chen. Hot chocolate and cookies will be served on the Lodge Terrace for the show, which will be followed by a torchlight parade on Dollar Mountain and fireworks. Tickets are $45 for the ice show only and $75 for the ice show and a meet-and-greet autograph party after the show in the Sun Valley Inn Limelight Room. All ice skaters will be in attendance and light hors d'oeuvres and a no-host bar will be available. Tickets are available at the Sun Valley Recreation Center or call 622-2135. 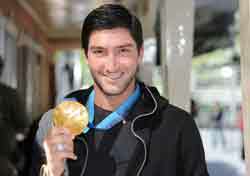 The appearance of 2010 Olympic gold medalist Evan Lysacek, 25, is a treat for attendees and for Lysacek too. "I'm very excited about going to Sun Valley," said Lysacek from a taxi in New York City. "I have never been in winter, and it will be an escape." Lysacek said a trip to Sun Valley was the only vacation he had this past summer, and it was relaxing. Lysacek is an interesting ice skating figure for many reasons other than competing in 12 U.S. Championships and winning eight medals throughout his time competing. He earned three World Championship medals—gold in 2009 and two bronze in 2005 and 2006. Lysacek has competed on "Dancing With the Stars" and has been noted for collaborating with fashion designer Vera Wang. "Ice skating fashion has come a long way," he said. "It's an element of the sport. Skating is always looking to the next element to appeal to audiences." Lysacek said skaters want their own identity on the ice. "It makes me different and unique," he said. "It's a whole personality on ice. Vera gave me inspiration. Bringing fashion into the mix didn't hurt. Lots of people are taking inspiration from fashion." Lysacek grew up in Chicago and said his parents wanted him to have skating skills. He said that when he first started skating he hated it, but he stuck with it. "When I was a teenager, I never got nervous competing," he said. "But that competitive nature is necessary because as I got older in my 20s, it got nerve racking." Lysacek said he has a formula that works for him through which he controls his thoughts. "With age comes wisdom and control," he said. "I'm more content with my career and appreciative of what I have." Lysacek has taken a break from competition but is very busy. Though he lives in Los Angeles, he said he spends most of his time in New York City. He's currently on tour with Smucker's Stars on Ice. He said he may go back to competing, but in the meantime he is working on a nutrition line, and has been part of a documentary film project, "Rise," which will premiere Feb. 17. "Rise" features figure skating luminaries, family and friends who share their memories of the 1961 U.S. World Team, who all died in a tragic plane crash. "I have not had a second off, but have stepped away from the competitive world," he said. "Something is still in my heart, and if I get back in shape and get ready, it could be one of many goals." Other events to celebrate the 75th season will be the Dollar Mountain Terrain Park Rail Exhibition featuring Sun Valley athletes and others at 3 p.m. on Friday, Dec. 17. The event will have live music and the exhibition will start at 5 p.m. Enjoy no-host food and beverage service at the exhibition. For the weekend, Friday, Dec. 17, and Saturday, Dec. 18, comedian Mike Murphy will do free shows in the Boiler Room at 7:30 p.m. Doors open at 6:30 p.m. Break out the old clothes for a Vintage Ski Party and contest at River Run Plaza on Saturday, Dec. 18, at 2 p.m. Wear vintage skiwear for prizes and enjoy music, food and raffle prizes. Also on Saturday from 3-5 p.m. will be a "Little Clyde: Horsing Around in Sun Valley" book signing by co-author and Idaho first lady Lori Otter at the Sun Valley Inn. The day will wrap up with the Sun Valley Tree Lighting Ceremony and festivities at 5 p.m. with ice sculptures, free hot chocolate, Sun Valley Carolers, Santa Claus and retail shops open late. The Sun Valley Lodge will have a Winter Solstice Dinner from 6-10 p.m. on Saturday, Dec. 18, and on Tuesday, Dec. 21, with a 75th Winter Season Celebration Gourmet Dinner in the Lodge Dining Room from 6-9:30 p.m. A la carte menu including entrée specials from opening night in 1936. For reservations, call 622-2800 or visit www.sunvalley.com.